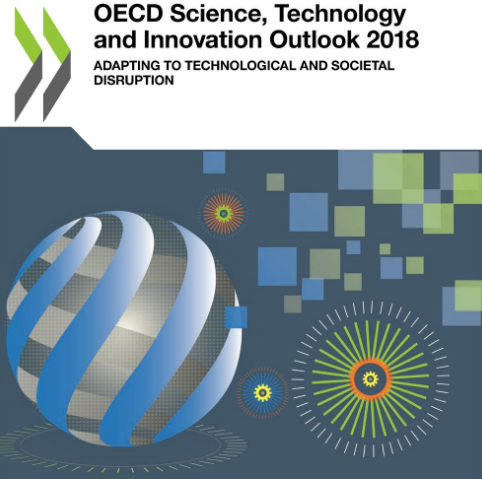 The OECD has recently released the 12th edition of the Science, Technology and Innovation Outlook, a biennial publication that analyses key trends in STI policies in OECD countries and major partner economies. The 2018 edition is mainly focused on how digitalisation is influencing research and innovation and how the Sustainable Development Goals (SDGs) are re-shaping the STI policy agenda. In line with SDGs, governments are trying to redirect technological changes towards more economically, socially and environmentally beneficial technologies and to encourage private STI investments along these lines. The report highlights the importance of this ‘mission-oriented’ approach that could contribute to the achievement of more ambitious goals. Despite this positive approach, data show that since 2010 government expenditures in R&D in the OECD area and in almost all of the G7 countries have stagnated or decreased. Between 2009 and 2016 the share of governments in R&D total funding decreased from 31% to 27%. The Outlook states that governments continue to find it difficult to steer research and innovation activities in the desired strategic direction, despite the fact that in many countries the decrease has been compensated by an increase in R&D tax credits. by exploiting the “digital traces” left by innovation and research processes, governments can embrace digital technology to design, implement and monitor STI. The common denominator identified by the report is the need for more adaptive policies that can better respond to disruptive scientific, technological and societal developments. This implies that governments need to be more agile, ensure policy coherence and maintain public trust. The whole report is available at this page.